I added 19 birds to my life list in 2012. 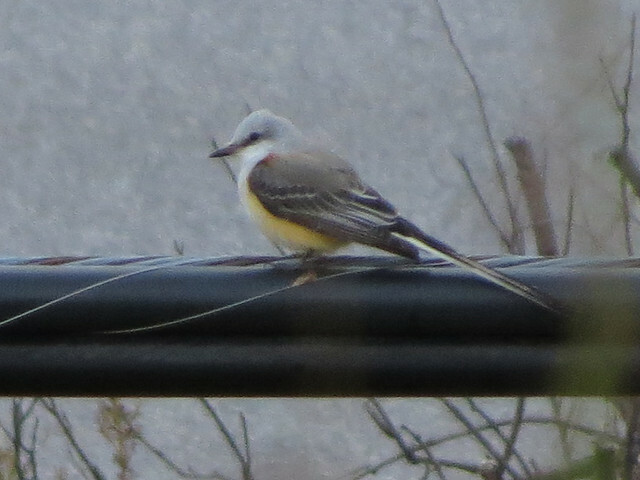 All but two came here in Florida; I saw a cagey Hooded Warbler in Tennessee in October, and then there was a flycatcher on the wrong side of town in Illinois (see below). Besides adding to my life list, I had some great birding experiences over the last twelve months, most of them in my new home state. Here are some of my favorite birding moments of 2012. The first lifer of the year came on the first day of the year. Arthur and I took a New Year’s dip in the ocean at Port Orange, then settled down for some birding. Northern Gannets were not unexpected; this was a bird we whiffed on multiple times in the Netherlands but hadn’t really sought out in Florida until that day. We were rewarded with mediocre looks which have since been much improved upon. 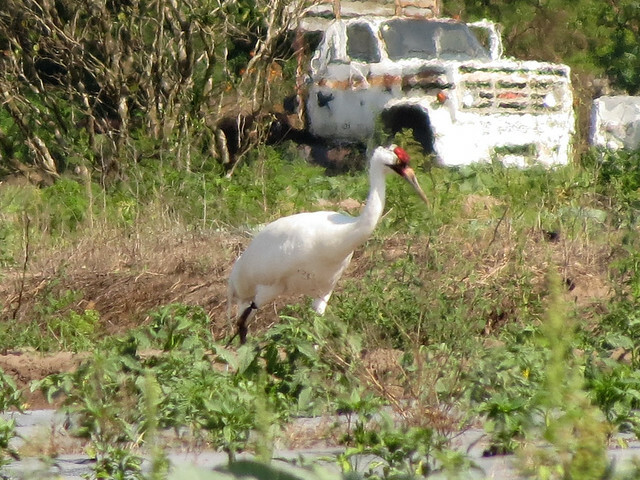 On March 23rd we twitched a pair of Whooping Cranes in neighboring Lake County. Though these reintroduced birds are not technically “countable,” we enjoyed seeing our first truly wild Whooping Cranes just a short drive from our home. 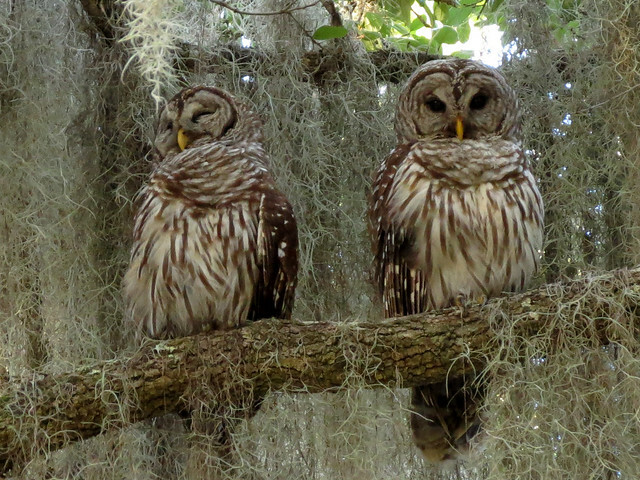 I had a fabulous time following a Barred Owl family at Gemini Springs throughout much of April and May. 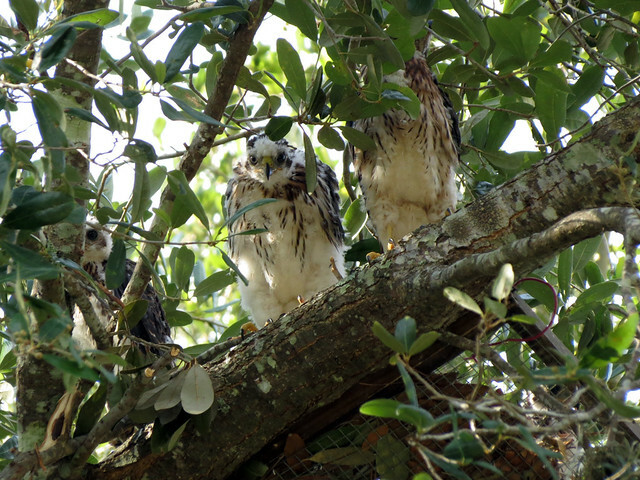 In May Arthur and I had the opportunity to help out a family of Cooper’s Hawks. 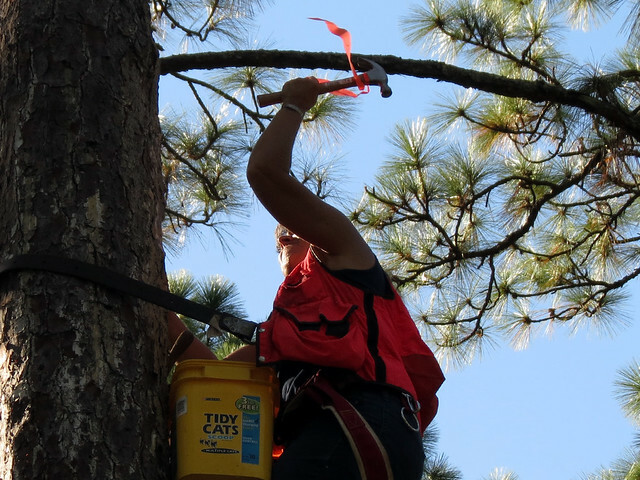 We rescued the fallen chicks after their nest fell apart, and later assisted tree climber extraordinaire Jim as he constructed a new nest platform and reunited the babies to their attentive parents. In September Arthur and I enjoyed an educational field trip to learn about Red-cockaded Woodpeckers. We got our lifer birds and also learned a great deal about the work being done to save them from extinction. 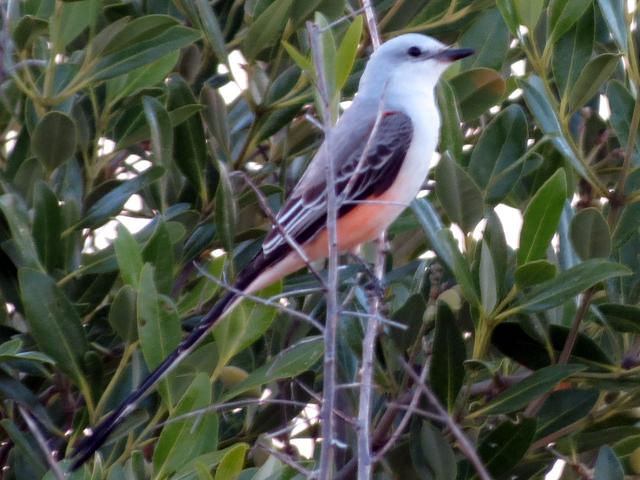 I saw my lifer Scissor-tailed Flycatcher in Illinois in October, then added it to my Florida list a couple of weeks later. Both gave pretty good looks but I couldn’t add either to my county lists of choice. 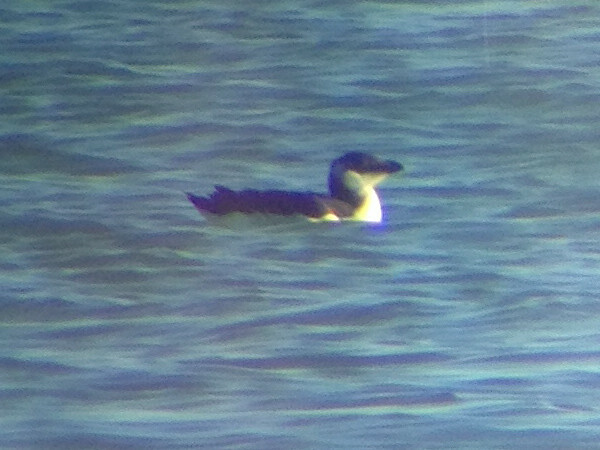 The last lifer of the year came a ten days ago when a Razorbill swam into the inlet at Lighthouse Point. They seem to have been hit-or-miss at the park in the last few days; I hope this will be one of my first birds of 2013. 🙂 In just a couple of days they will ALL BE NEW BIRDS MWAHAHAHA! *Spoiler: I did see a Razorbill. In case you haven’t heard, Florida is having an unprecidented Razorbill invasion. 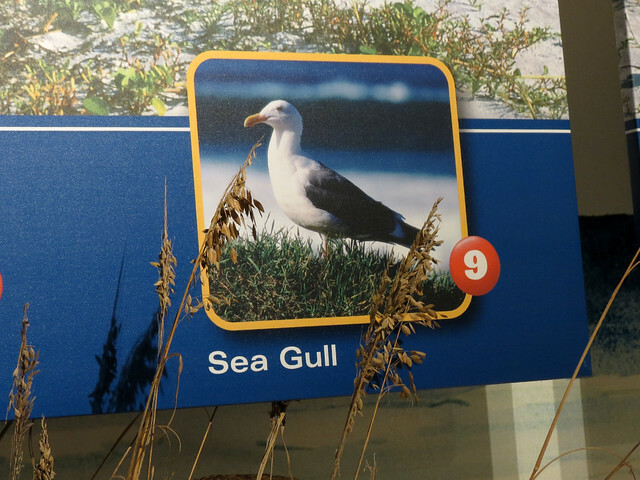 They have been seen all up and down both coasts, as far west as Pensacola on the Gulf coast. They usually don’t venture further south than coastal North Carolina or so. 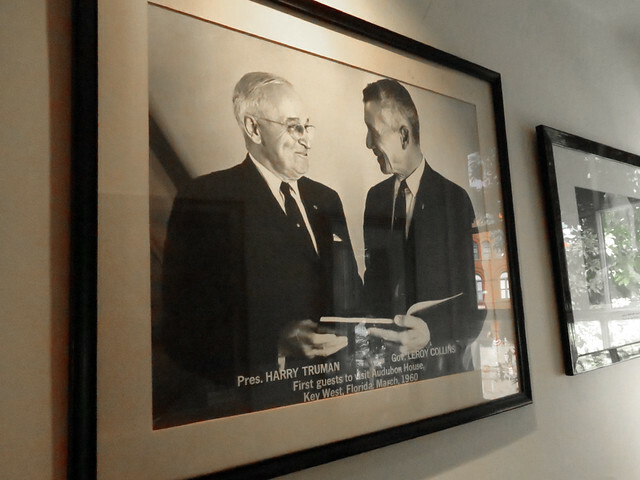 Florida had a handful of records prior to this invasion. On December 12th I went to Lighthouse Point Park in Ponce Inlet, where Razorbills had been reported in earlier days. When I arrived at about 12PM it was drizzling steadily. I decided to walk out on the jetty without my scope. The rain came on and off, and though I didn’t see any Razorbills, there were birds around. 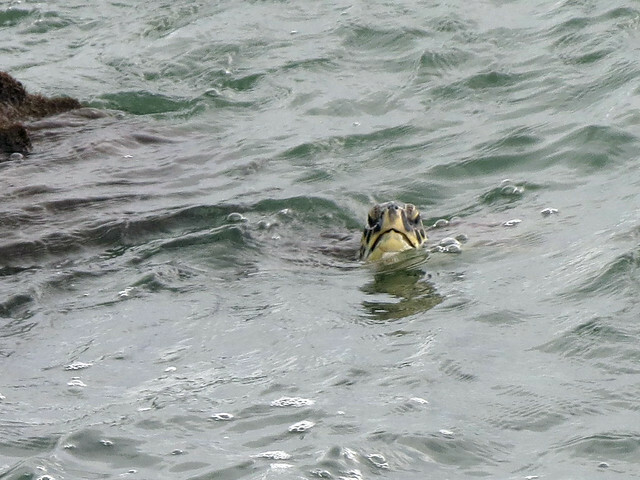 I even saw a sea turtle. I headed back into the inlet for a while, where I saw a huge flock of Black Skimmers fly down to land on a sandbar. I added a few other birds to my day list and watched some dolphins playing by a marina. The skies cleared a bit and I walked back out onto the jetty, this time with my scope. When I arrived at the end, birder Michael Brothers was there and informed me that a Razorbill had been seen about a half hour prior. Well, I stepped away just in time then, didn’t I? D’oh. I looked for another 45 minutes before I had to leave. It started raining again on my way back in and I got soaked. Sad, sad Razorfail. A half hour later I went back out on the jetty again with Arthur for a short look, but we didn’t see a Razorbill. 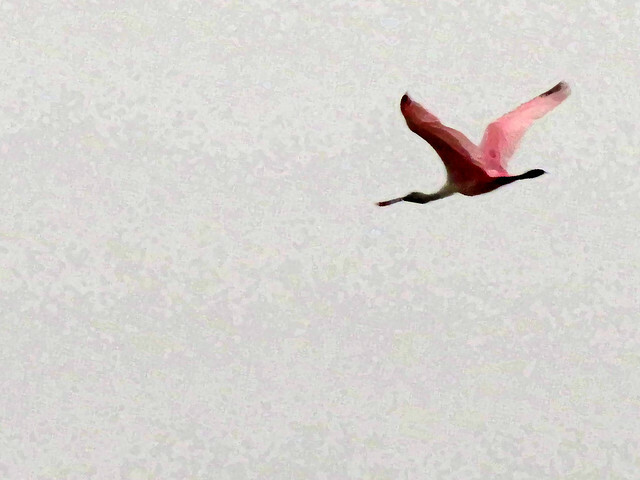 We did see a flyover Roseate Spoonbill, though. Big pink birds are always good, even far away and in the rain. Last Wednesday I went out to Ponce Inlet again. Now the weather was spectacular — cool but sunny, with a bright blue sky and relatively calm waters. I collected my scope, binoculars, and camera, and headed out onto the jetty. A large group of Black Skimmers was loafing on the beach. They seemed quite photogenic so I stopped to take some photos, but my camera didn’t react. The card door was open and the card slot was EMPTY. After ransacking the car it became clear I had another case of Razorfail — there would be no photos this day. I consoled myself by thinking that such an error probably guaranteed I would see a Razorbill. I was right. I set up my scope and looked. And looked. And looked. A pair of Red-breasted Mergansers, a Common Loon, and a large flock of scoters all went by. Good birds, but no Razorbill. After about two and a half hours, Mr. Michael Brothers came out onto the pier. And about 20 minutes after that, he pointed out my lifer Razorbill to me. It appeared in the mouth of the inlet, actively feeding. It would bob up momentarily before disappearing underwater for extended periods. Michael left after a short while, but I stayed on the Razorbill for another half hour or so. After the feeding frenzy, it had an extensive period of preening, giving me very nice looks and letting me snap some terrible iPhonescoped shots. I didn’t take any nice photos but I’m happy I got to spend some quality time watching this special visitor. Good luck, Razorbill. 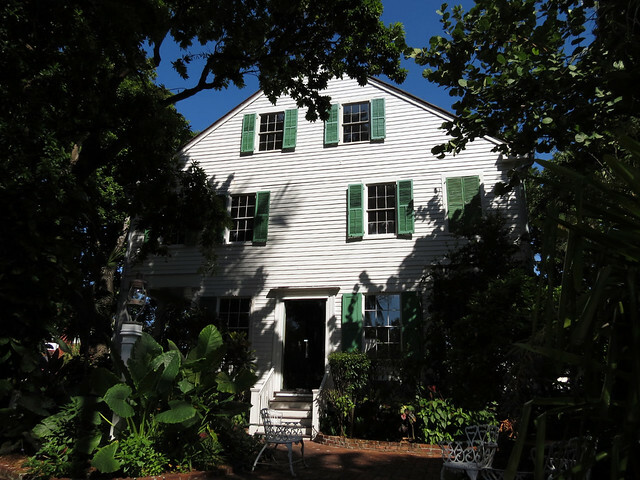 The Audubon House in Key West is a bit of an odd attraction. 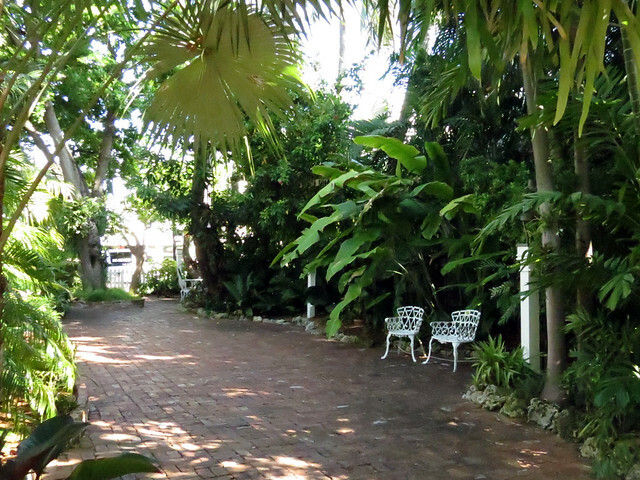 The home was built in the late 1840s by Captain John Geiger, a pilot who became rich by salvaging vessels that wrecked along the Florida Keys. 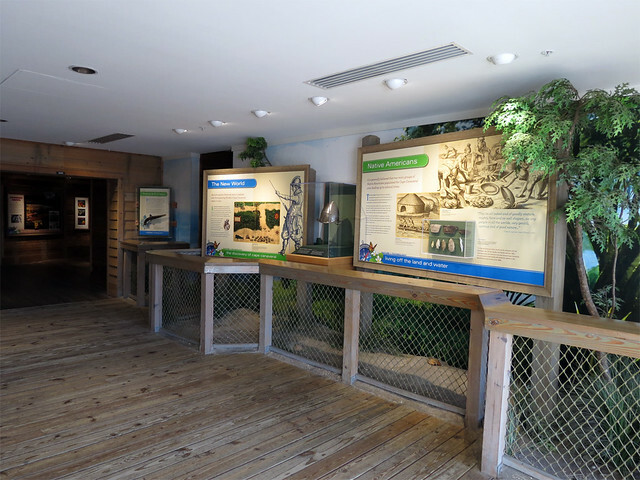 The home was saved from demolition in the late 1950s and eventually became a public museum, dedicated to commemorate John James Audubon’s visit to Key West. 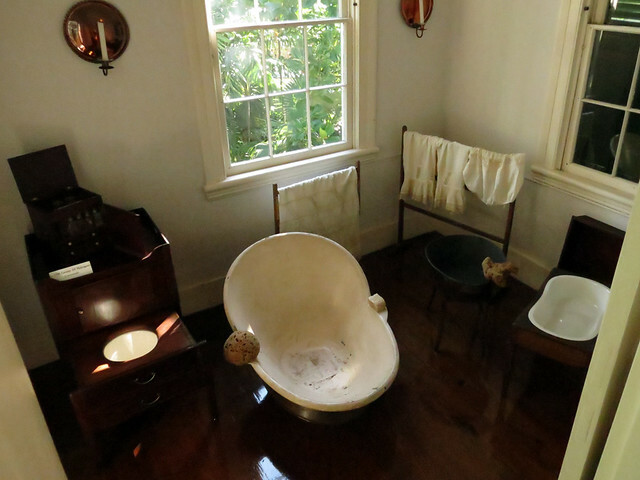 That visit took place in 1832, when the artist apparently met with Geiger and other Key West notables. 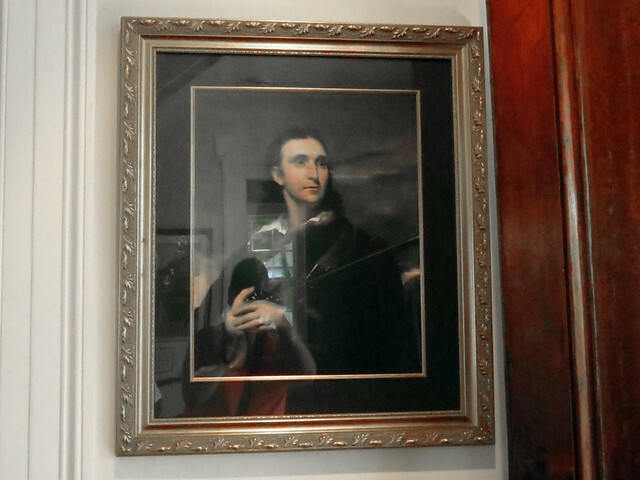 He could not have visited the house, but he may have been on the grounds. 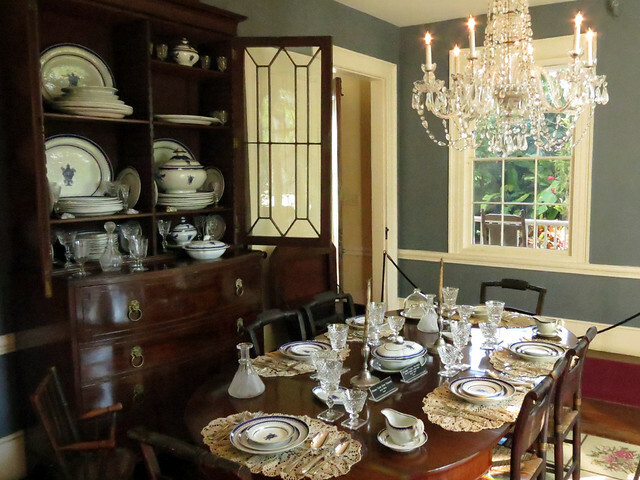 It’s a lovely home, restored to how it may have been during its prime in the mid 1800s. 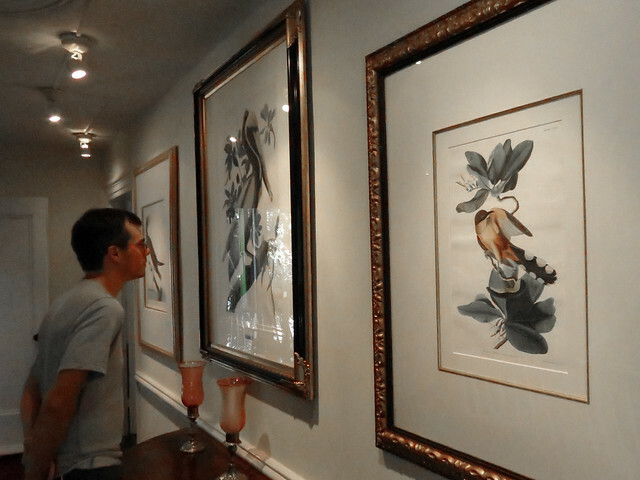 The rooms are furnished with period furniture and Audubon prints. 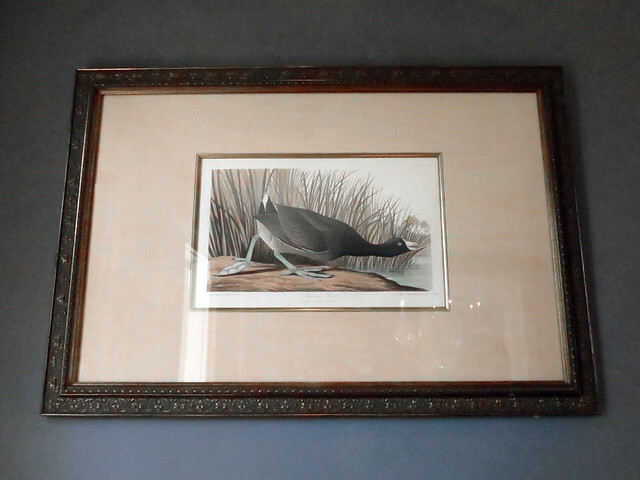 The link to John James Audubon may be a bit tenuous, but we did enjoy our visit back in September. 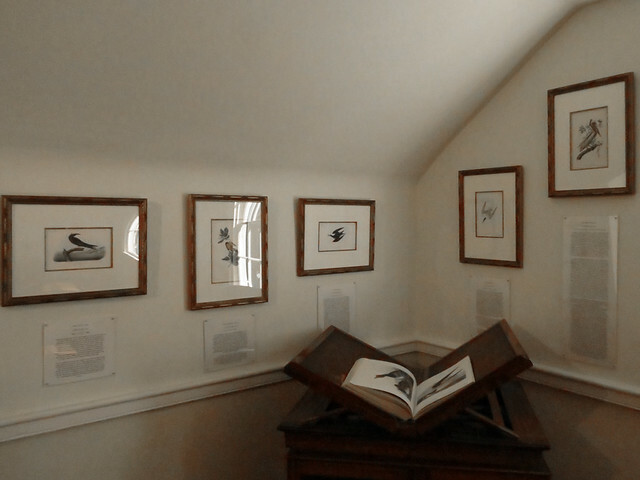 It’s always nice to see original Audubon prints, anyway. 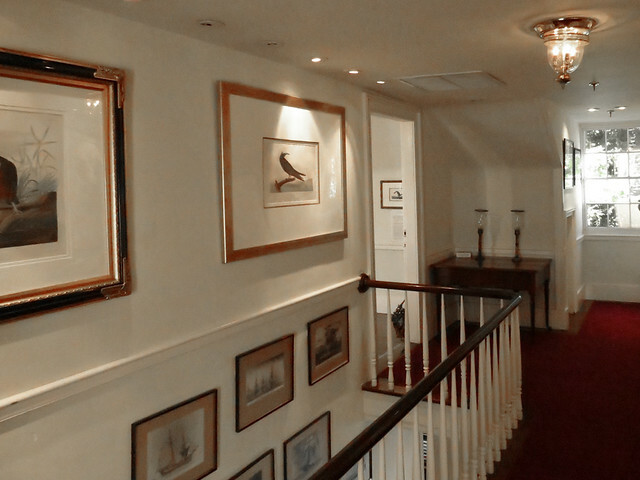 We had a brief guided tour of the first floor of the house, with a self-guided tour of the upstairs gallery rooms and of the lovely gardens. If you are planning to visit the Audubon House, be sure to print out this coupon to save $1 on your admission. Hours and prices can be found at the link, too. In mid-September Arthur and I drove down to the Florida Keys for a few days of camping, birding, and snorkeling. One morning we took a walk along Bahia Honda State Park’s Sandspur Beach before snorkeling. 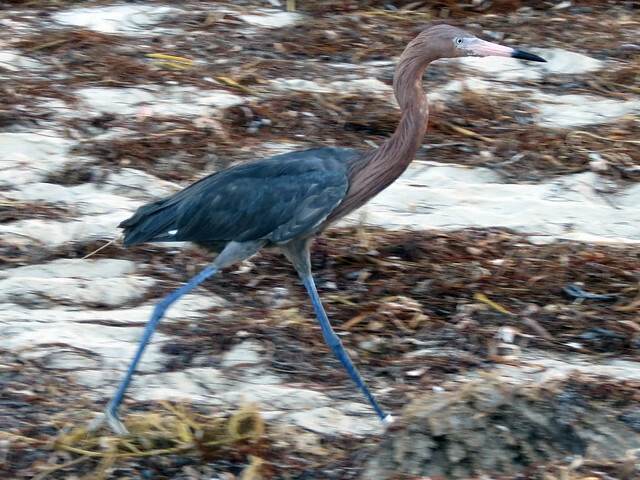 We saw a few birds, including a Reddish Egret who was actively hunting in the surf. The light wasn’t great so I wasn’t planning on taking any photos, but then I noticed the bird was banded. I got out my camera and took a few shots. 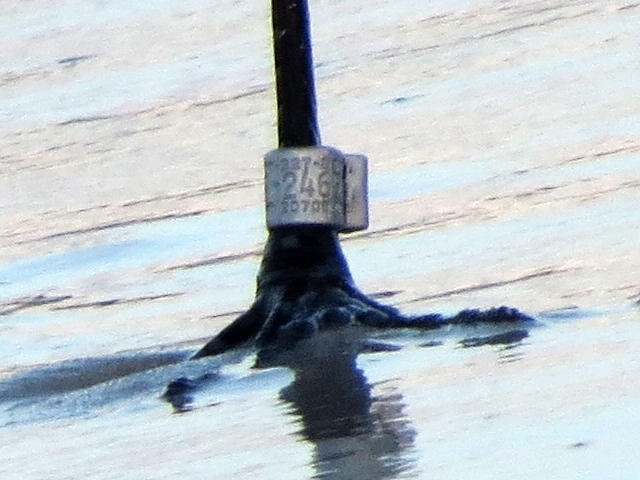 From my photos, I was able to tell that the last five digits of the band were 24697. With this partial information I went to the USGS Report a Band site to report the sighting. I was surprised that I was unable to submit the form without the full band number. So I did a little Googlin’ and found Clay Green via Heron Conservation. Though he wasn’t banding birds around the Keys, I was hoping he’d be able to send my information on to someone who could use it. The following reply came back from Dr. Kenneth D. Meyer of Avian Research and Conservation Institute (posted with permission). 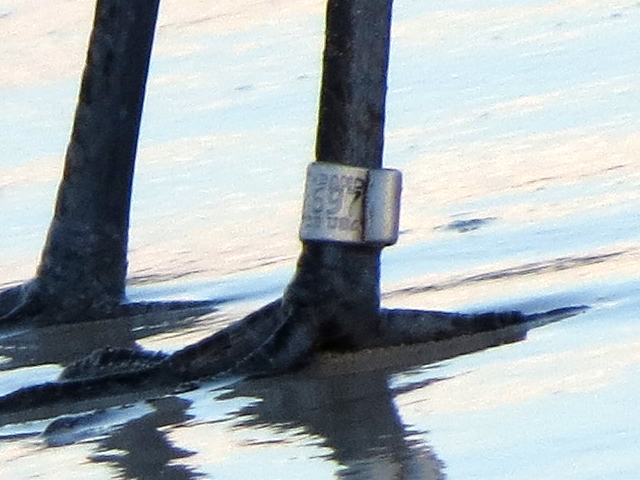 We (ARCI) banded this bird on 27 January 2010 on Ohio Key, Florida Keys (near where Amy saw it). Sexed by blood sample as male. We were deploying satellite transmitters at the time but did not tag this bird because he had a large growth (external, abdomen) which Dr. Marilyn Spalding, a veterinary pathologist, advised may have been a result of a previous nematode infection (Eustrongylides sp.) that had become walled-off. 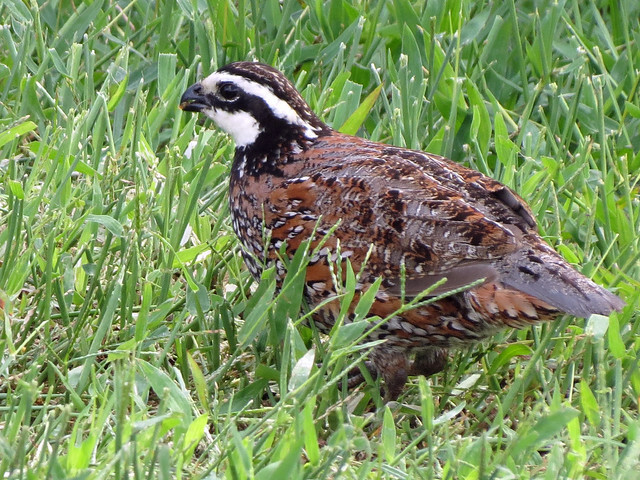 We have observed the bird several times since then while working in the area, but not recently. Very good to know he’s still alive and in the area. 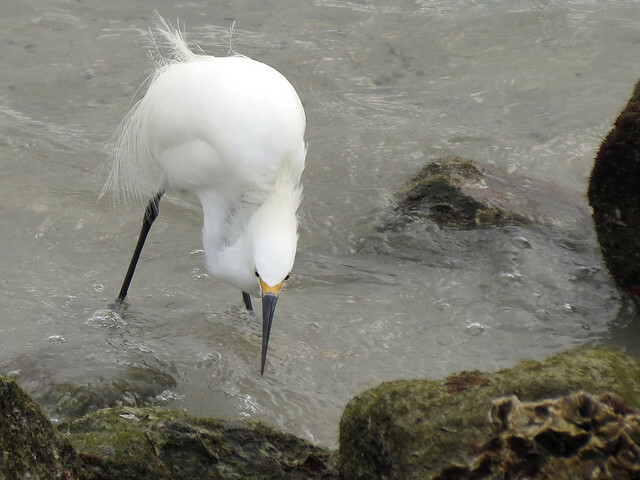 The eight Reddish Egrets that we captured in the lower Keys and tracked by satellite all remained year-round in the area, making habitual seasonal movements of, at most, 30-40 miles. 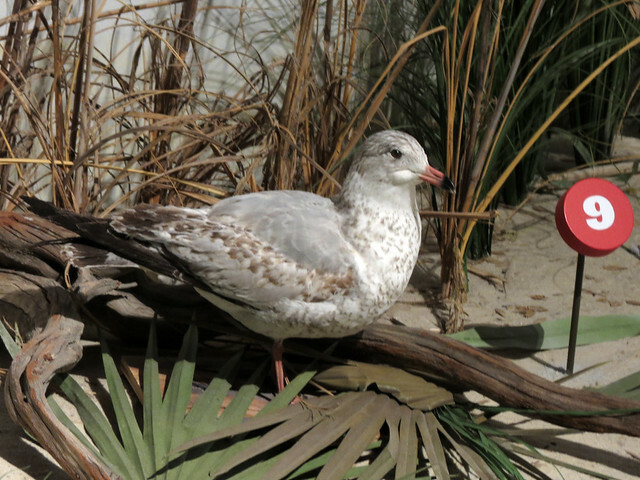 When captured and when later observed, this bird had several white and gray primaries, wing coverts, and tail feathers (bilateral). I’m wondering if Amy saw this or was able to take any photos. 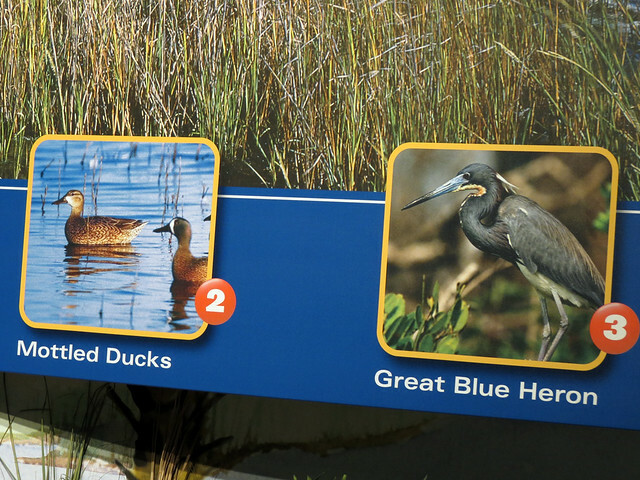 Here I have to admit that at the time of the sighting I was so excited to a) see a banded bird and b) be able to photograph readable band photos that I didn’t spend nearly enough time just plain observing the dang bird. D’oh. 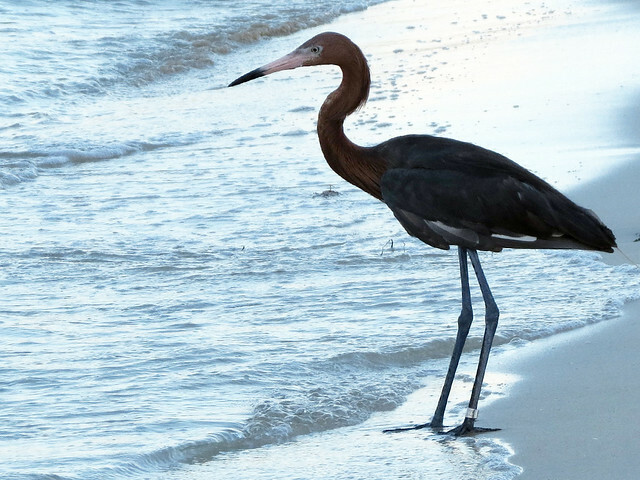 It was behaving in a manner I would consider entirely normal for a Reddish Egret – actively hunting by darting around the shallow water, gingerly avoiding us human observers but acting neither overly wary nor especially confiding, and moving around on the beach as big waders do. I also didn’t notice many odd white feathers on the wings or tail, and I certainly didn’t notice any lesion on the chest. Here are my two best photos of the bird. After seeing my photos, Ken indicated that the lesion had been quite large; it may be out of sight in my photos or it may just be gone. I was glad to find the group who banded the Reddish Egret (REEG, by the way), and that my information may have been slightly useful. I learned my lesson, too. I am quite content to quietly observe a single bird for an extended period of time… but in this case I got a little bit overexcited about seeing a banded bird. Next time, I need to calm down and do what I enjoy most — observe the bird! After I record that band number, that is! After observing the Red-cockaded Woodpeckers during the early portion of last week’s field trip (see post Looking for Red-cockaded Woodpeckers in Ocala NF), we returned to an abandoned cluster of woodpecker cavities to learn more about how biologists study Red-cockaded Woodpeckers and how they establish new, active clusters. 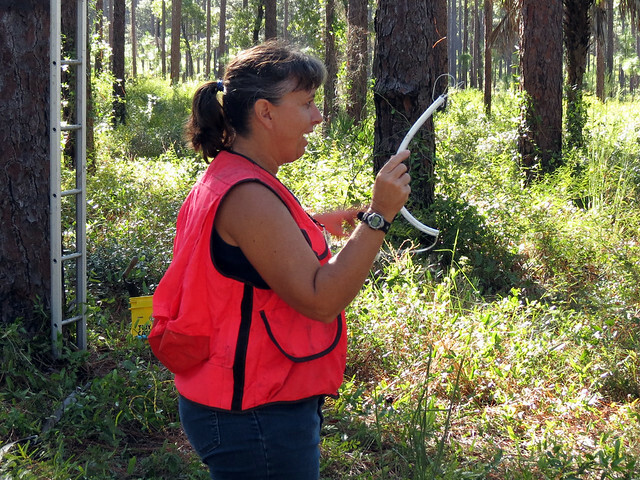 Monica Folk, our field trip co-leader, is a biologist specializing in endangered species. 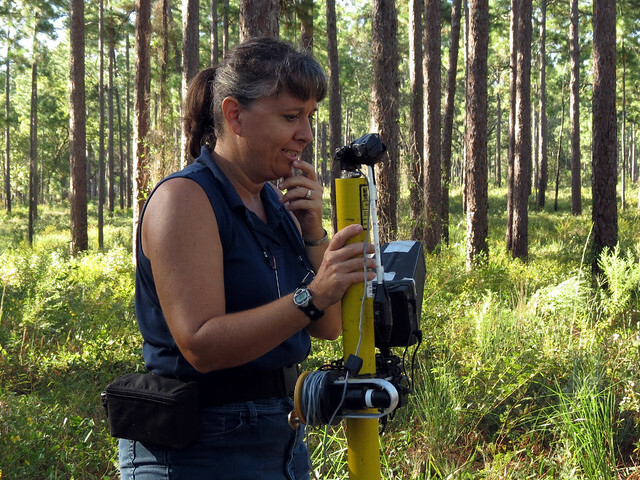 She worked to reintroduce Red-cockaded Woodpeckers (RCWOs) in the Disney Wilderness Preserve, which now has a sustainable population. 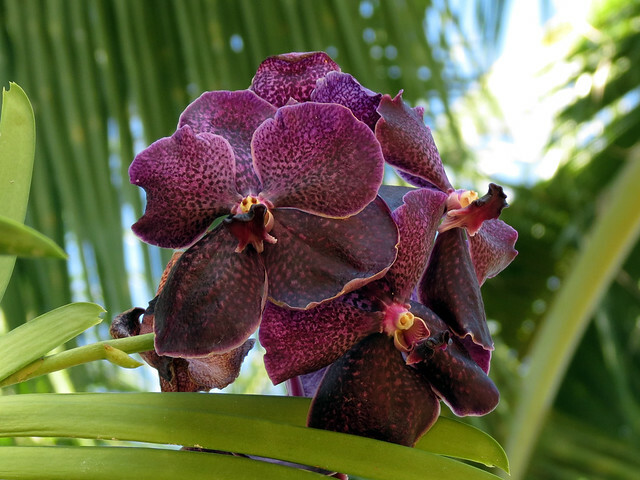 The heart of establishing a new, successful cluster of RCWOs is the artificial nest cavities. 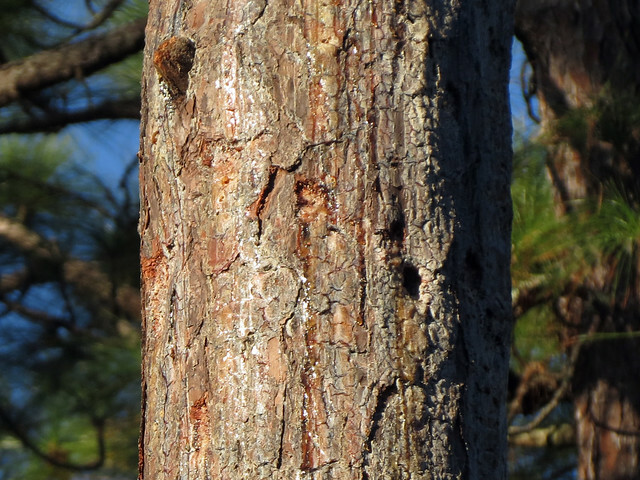 Since it takes a male woodpecker up to 4 years to complete one cavity, biologists give the birds a head start by installing pre-made cavities into living pine trees. The cavities are made of solid cedar wood. A woodpecker-sized hole is drilled downward into the wood and then a panel is placed on top to close the box. The hole is cut out of the front and then fitted with a piece of PVC pipe to prevent other woodpeckers (Red-bellieds and Pileateds, primarily) from taking over the box. If this happens, the box is “blown out” and will no longer be used by the RCWOs. 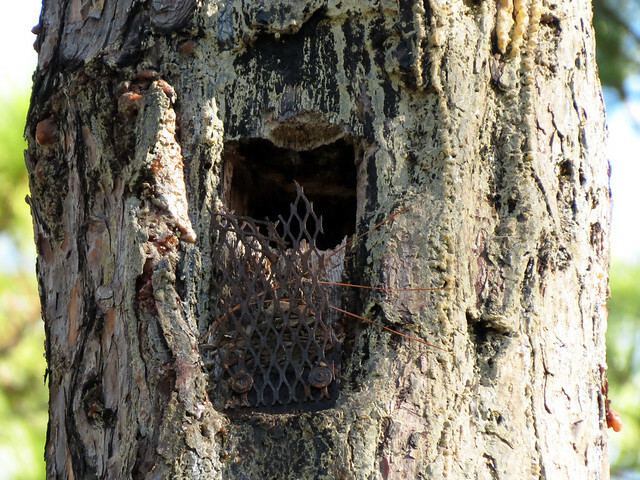 Wire mesh is also added to the front of the box to prevent predation and damage by other woodpeckers. Chainsaws and crowbars are used to carefully cut out the hole in the living tree. The outside of the box is covered with adhesive and then the box is pounded into the tree. To make the cavity more attractive, hammer holes are pounded around the cavity opening to release resin. Once a bit of sawdust is added to the box, it’s ready to house a RCWO. Damaged cavities can be replaced, and cavities used by other species (Eastern Bluebirds and Carolina Chickadees are two species that may use abandoned RCWO cavities) can be cleaned up to make them attractive to the woodpeckers once more. During the demonstration, Monica used a shop vac to clear out bluebird nesting material from an otherwise fine nest box. Once the requisite number of cavities are set up within a cluster area (10 acres or so, depending on habitat), and the required and desired number of clusters are set up within a reintroduction area, site biologists may receive juvenile birds from established breeding sites. 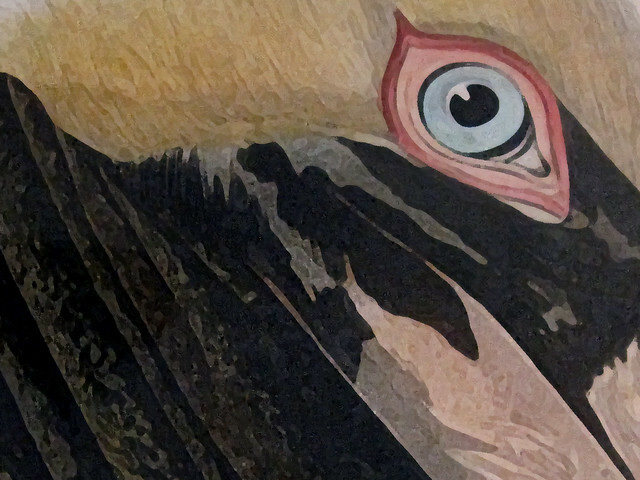 Retrieving birds is a very involved process which requires a lot of prior research and contingencies for a myriad of possible scenarios come “kidnapping” day. Birds are captured using long, telescoping nets. The net is placed over an active roosting cavity once the bird is inside for the evening; the tree is disturbed (tapped or shaken) to get the bird to fly out again, this time into the net. The RCWO flies out and eventually lands at the end of the long net. It is then safely removed from the net and then placed into a special box. The box has a cloth “sleeve” attached around the top. 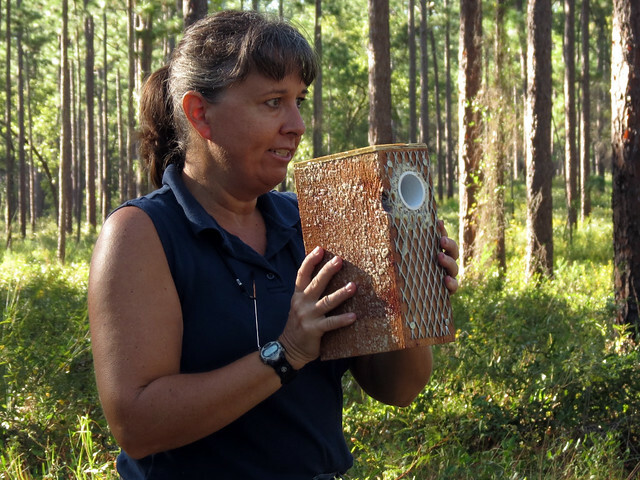 The sleeve allows biologists to open the wooden box and reach in to remove or replace the RCWO without the bird escaping. 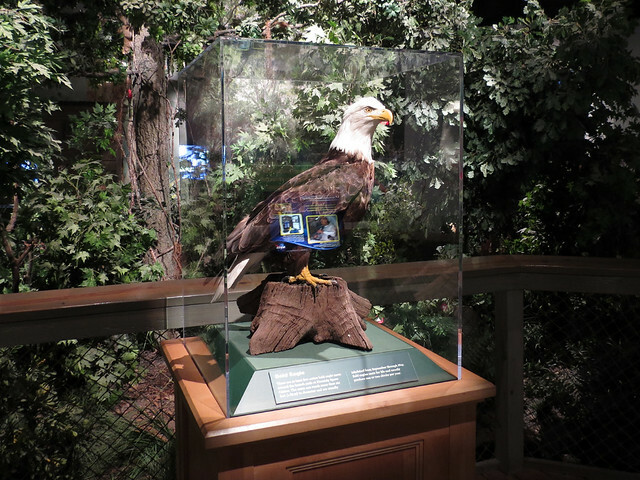 During the relocation process, the birds are captured at or after sundown, and sleep the night in the box. The next day, starting at sunrise, the birds are hand fed (!!) 3 prey items (ie crickets) every 45 minutes (!! ), until sunset. 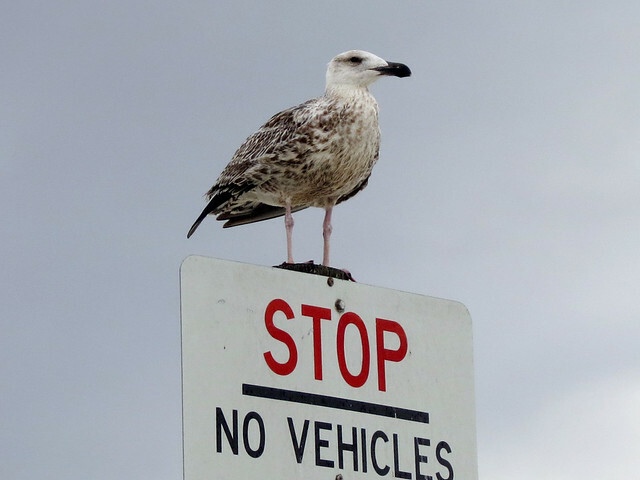 It’s odd that these wild birds will readily accept food in the hand, but their natural biology has them eating nearly constantly every waking moment, so their hunger must override any fear they might have of humans. Shortly after sunset, the birds are relocated to their new habitat. One young female and one young male are placed into a new cluster. Each bird is put into a cavity, where it sleeps for the night. A screen cover is placed in front of the opening to ensure the RCWO remains inside its cavity until the next morning. The cover is removed remotely from below with a string attached to the screen. RCWOs typically vocalize at waking, and keep in contact with their cluster-mates throughout the day. With this habit, the new birds are able to find each other at first light and hopefully begin foraging and/or exploring the new territory together. The woodpeckers are monitored during the breeding season. In the past, biologists had to climb ladders as tall as 40 feet in order to look inside nest cavities. 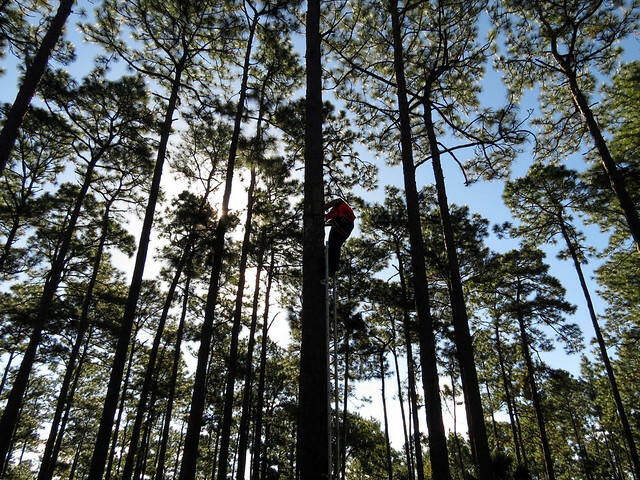 Nest monitoring takes place every 7 days and a biologist may have several clusters to check – that’s a lot of climbing! Today biologists may utilize a “peeper scope” — a camera set up on a long telescoping pole with a monitor or viewfinder at the bottom. The scope is raised up to the level of the nest and gently poked inside. RCWOs may lay up to four eggs. Incubation begins after the second egg is laid; the eggs hatch after just 11 days of incubation. The nest is usually in the male’s cavity. The female will incubate during daylight, where she is fed by the male throughout the day. The male incubates at night (which makes sense — the eggs are in his cavity, after all!). Biologists check the nest cavities for eggs. 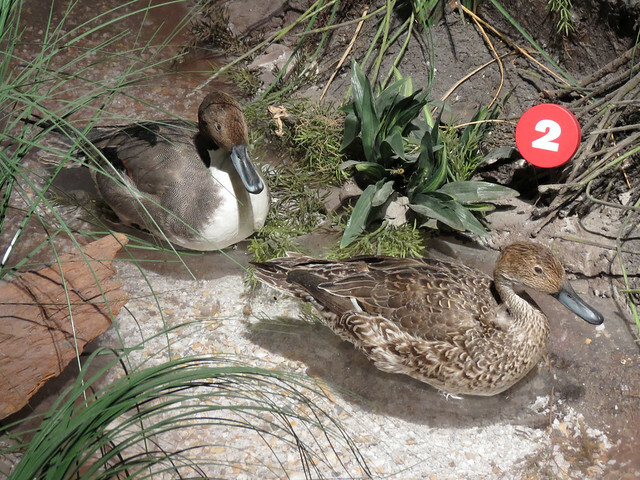 Depending on the number of eggs found, they can calculate when hatching may occur. This is important to know, since the chicks develop quickly. Eleven days after hatching, the chicks are still featherless, but their legs have already grown to their full size. This is when the chicks are banded. The procedure for retrieving the chicks for banding seems a bit tricky. 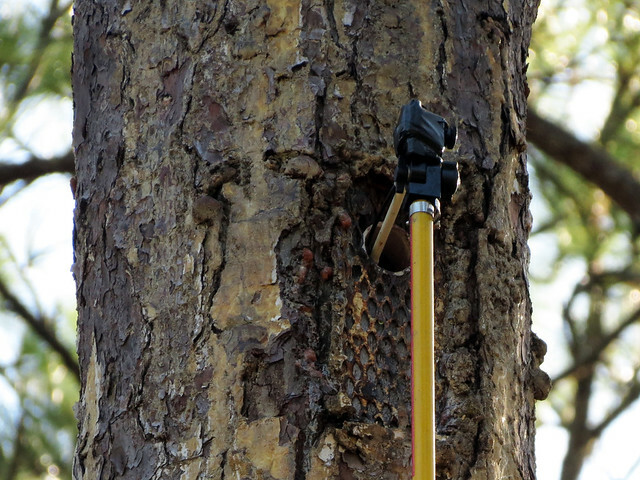 The nest cavities are permanently installed in the tree; there is no hand-sized opening. Biologists climb up on a ladder and use a small, delicate plastic “noose” to gently pull the chicks, unseen, out of the nest. A simple mirror on a stick is used to check that all hatchlings have been removed from the nest. 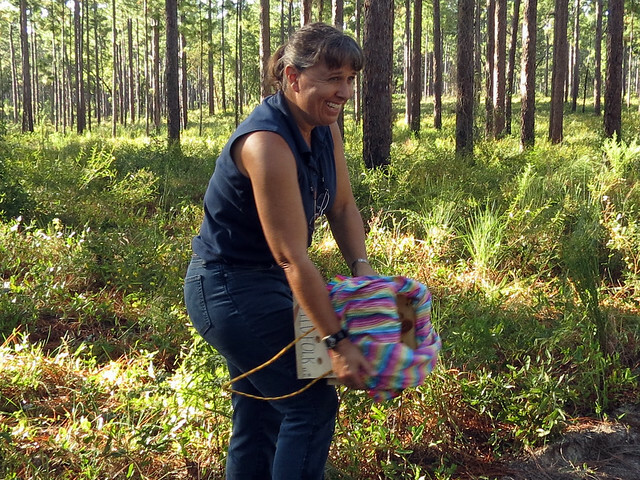 The chicks are carried down to the ground, banded and measured, and then gently returned back to the nest. 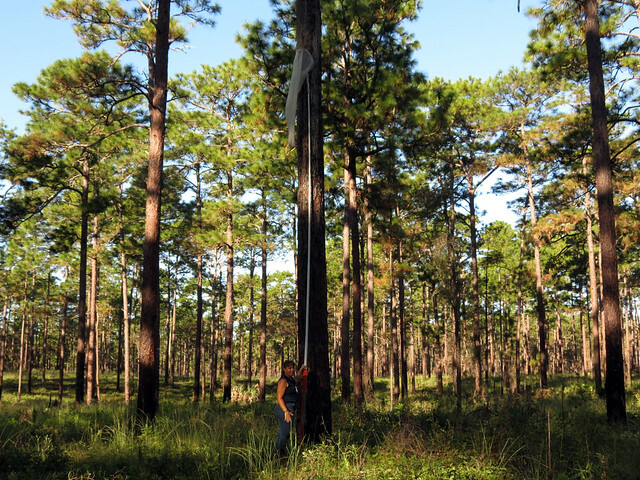 RCWOs at the Ocala NF sites we visited are fitted with five bands each. Three color bands are on one leg, while the other holds the metal federal band and one color band. This means the birds can be monitored without further capture and RCWOs that branch out to new territories can be identified and followed. It was fascinating to learn about Red-cockaded Woodpecker biology and monitoring. Life bird + learning cool biologist stuff = big win! 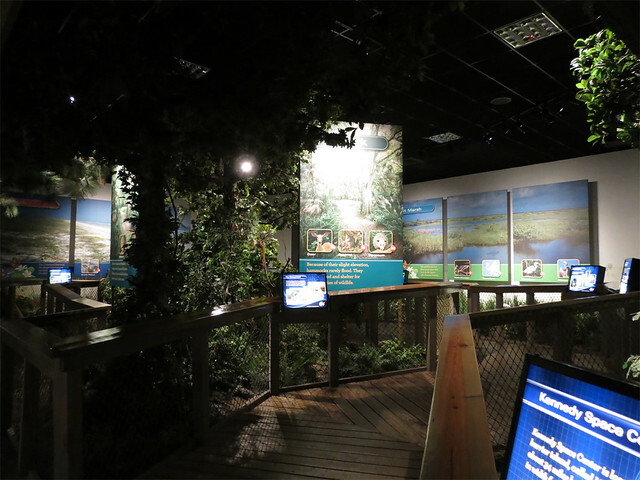 NOTE: I’ve composed this post from information that Monica shared with us during the field trip; hopefully I’ve gotten the facts straight but obviously any factual errors here are strictly my own. 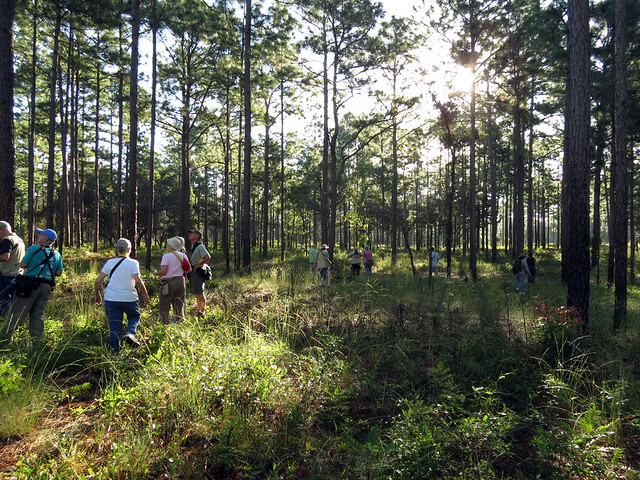 On Friday, September 28, Arthur and I attended a field trip at the Clearwater Recreation Area of Ocala National Forest. The trip, part of the inaugural Wings & Wildflowers Festival, was to look for Red-cockaded Woodpeckers and learn about how biologists study and conserve this endangered species. 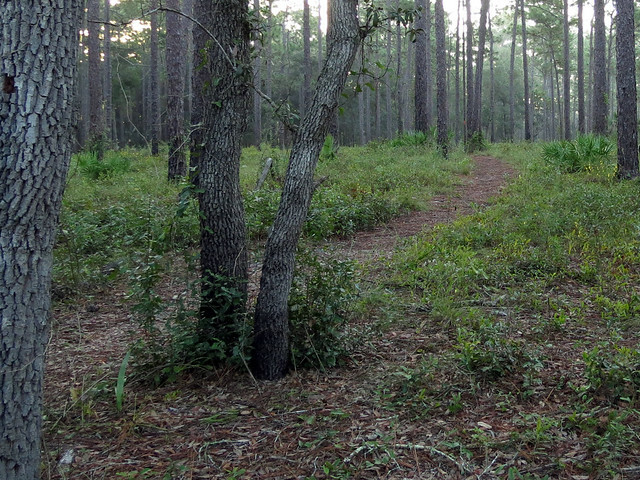 We began our walk out to a Red-cockaded Woodpecker (RCWO) “cluster” just after sunrise. Along the way, trip co-leader Monica Folk told our group about RCWO ecology, family groups, and nesting behavior. RCWOs are somewhat unique in that they are cooperative nesters. Just about 8% of bird species are known to be. Cooperative nesting means that offspring from previous nesting seasons may stay close to their parents and help raise subsequent broods. 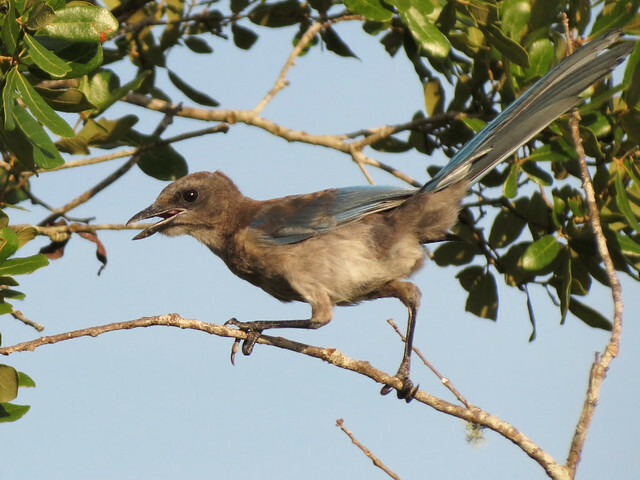 Young females are usually the first to branch out from the extended family, much like Florida Scrub-Jays (also cooperative nesters, also endangered). 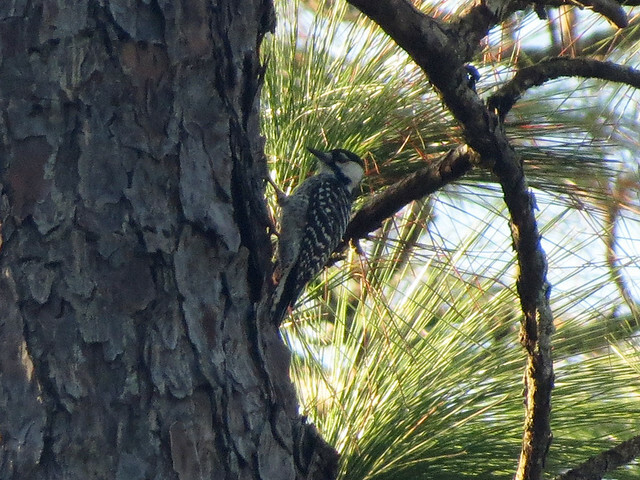 RCWOs are also unique in that they are the only species of woodpecker to make their cavities in living pine trees. The birds roost in individual cavities at night, so a family group consisting of 4 birds should normally have at least four cavities within its territory (the cluster). The males excavate the cavities and it takes up to four years to complete one cavity. 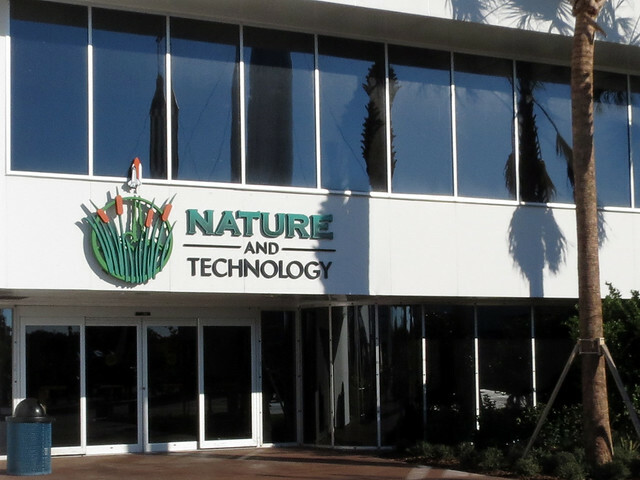 Active cavity trees can be identified by small holes bored around the cavity entrance. RCWOs create these little wells which cause the tree to exude resin; the resin helps protect the cavity from predatory rat snakes. 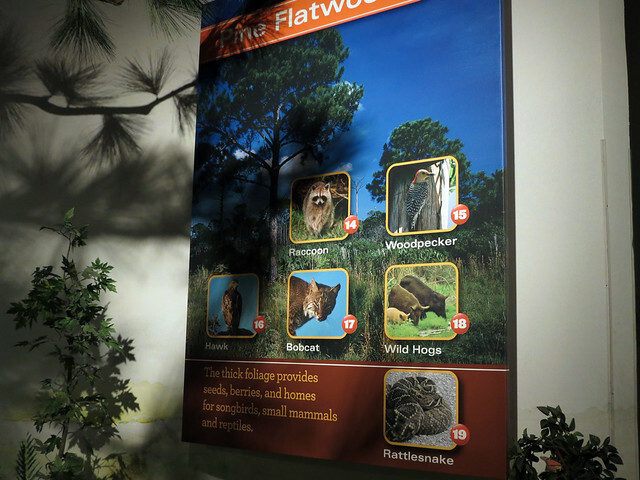 RCWOs have a lot of other specific habitat requirements in order to successfully nest. The type of vegetation found in the ground cover, wildfires and forest rejuvenation, and even tree fungus (!) are just a few things that come into play. Red-cockaded Woodpeckers like to nest in the same kind of trees humans cut for timber on a mass scale in the last 150+ years. Habitat loss has resulted in the RCWO population currently estimated to be 12,500 individuals, which is about 1% of its original population. 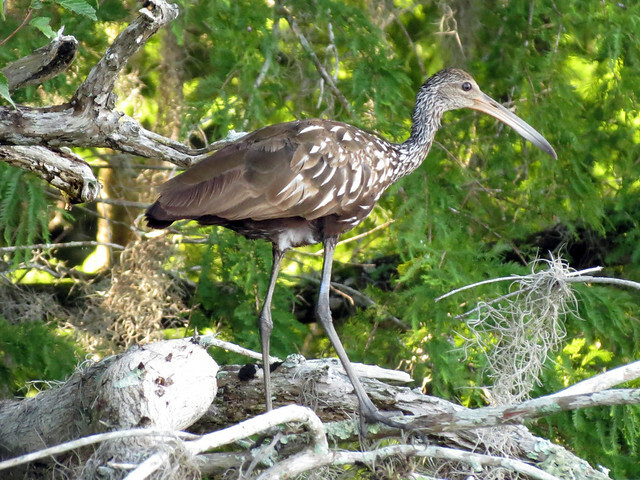 Biologists are helping RCWOs by preserving suitable habitat and identifying potential future habitat, and by introducing birds into areas fitted with artificial nest cavities (more about those in an upcoming post). Our walk brought us to an area fitted with a few artificial cavities where a lone male was known to live. The male was associating with a female who was thought to roost elsewhere (a commuter!). So when we came upon at least three individuals actively feeding at the cluster, it came as somewhat of a surprise. One of the birds was clearly exhibiting the begging behavior of a juvenile, indicating nesting success at the site. The sun was behind the birds as we watched them, but I managed to take a few record shots. Our binocular views were much better; we were able to drink in this new life bird. The below video isn’t in focus but you can see two RCWOs scooting upwards, with debris from a third bird falling below. They move around the trees, tearing off pieces of bark to find insects below. We were watching them have breakfast. Listen to their cute squeaky toy call, too. In my next post I’ll share some of what we learned about how biologists establish new clusters and monitor the birds. Hint: some of it involves really tall ladders! When one doesn’t have the chance to go birding as much as one would like, it is nice when the birds come to one. 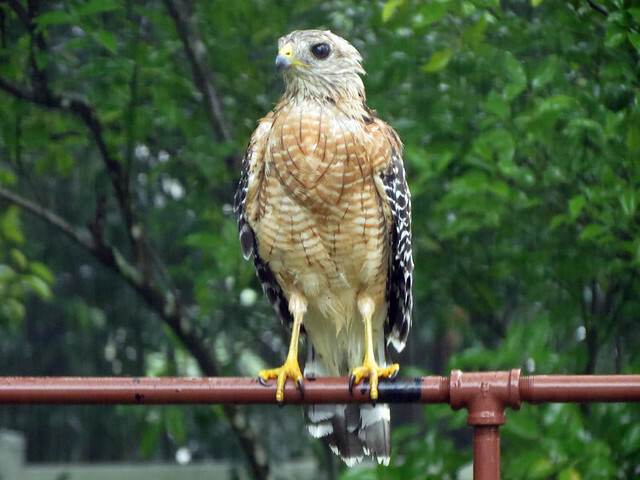 During a heavy thunderstorm last week, Arthur called me to the window to watch a Red-shouldered Hawk feeding on something in our back yard. The bird was eating while standing completely exposed in the middle of the grass. It was soaked. 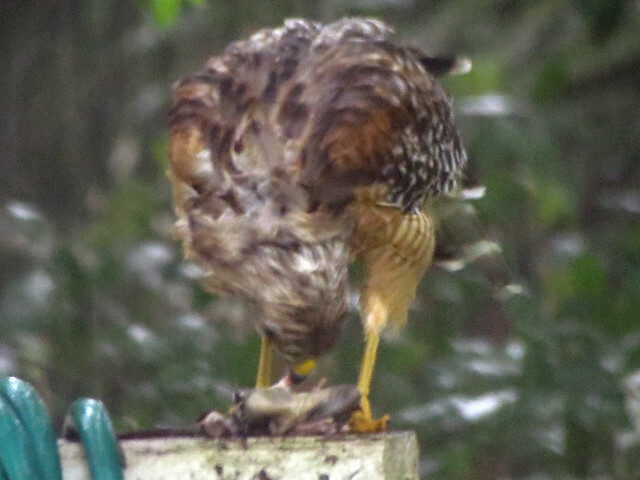 After a few bites, the hawk grabbed hold of its meal, a rat, and flew to a post to finish the job. 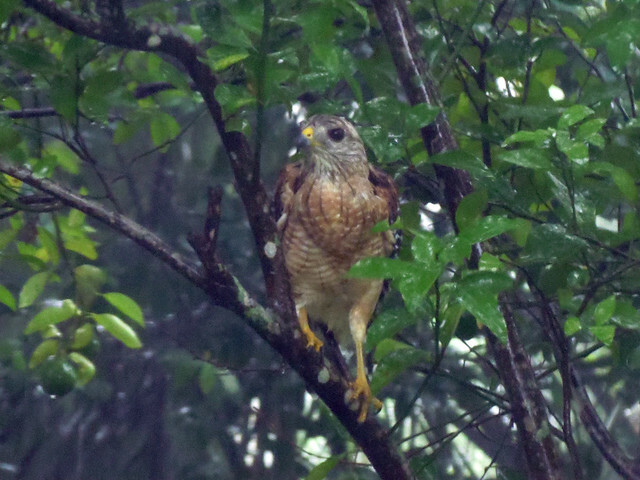 With not much remaining to the prey but fur and tail, the meal was finished and the Red-shouldered Hawk retreated to a nearby citrus tree. 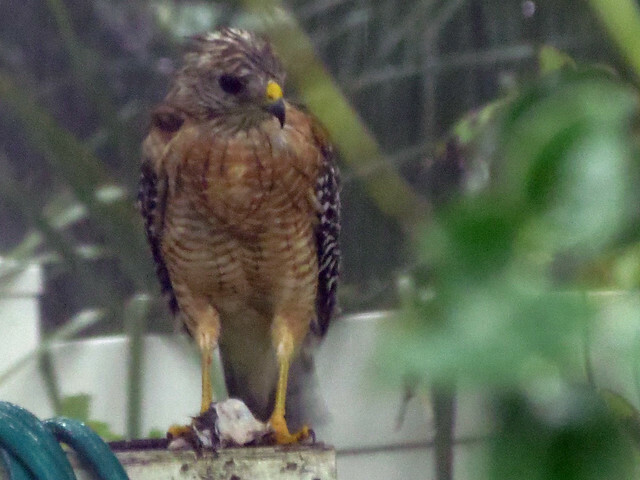 I thought it might wait out the storm under the relative shelter of the tree, so I was surprised when the hawk took off and flew to an exposed perch, a metal bird feeder pole. There it remained for just a moment before taking off once again and leaving our yard. Here’s a short video to give you an idea of the rate of rainfall during this encounter. That’s a pretty hearty hawk, huh? Or perhaps just a hungry one. I first learned about the June Challenge last year, but our move to Florida was too late in the month for me to participate. This year I set a goal of 75 species, which I reached — just! The complete list is at the end of this post. Part of the point of the challenge is to get birders out in the field in a hot, traditionally boring time of year for birding. The heat got to me, I admit, and I didn’t get out as much as I would have liked. In the end I added 30 checklists to eBird in June, and a few of those were incidentals to add species expressly for the challenge (like the single-bird lists featuring Common Nighthawk, House Sparrow, and European Starling — all seen in parking lots). 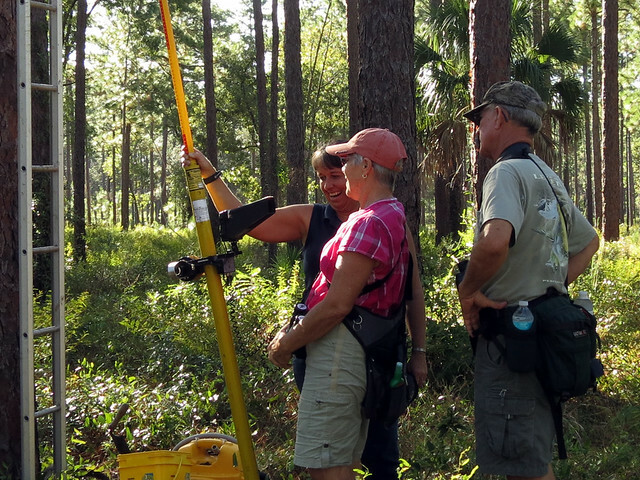 Another point of the challenge is to get birders to try new birding locations. 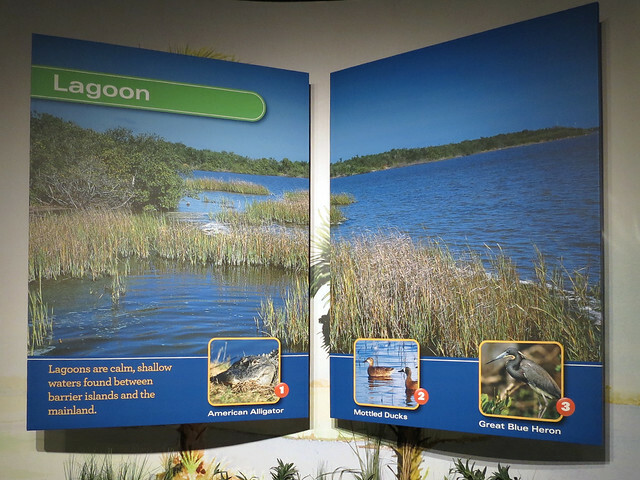 I birded three new-to-me spots in Volusia: Heart Island Conservation Area; Palm Bluff; and Lake Ashby Park. Each brought me at least one species seen nowhere else during June, and as a bonus I got some new scenery in an otherwise “boring” month. I studied eBird checklists to determine some target species. Two species were surprises because they weren’t recorded by other Volusia eBirders in recent Junes: Barn Swallow and Least Bittern. My best birds were Common Nighthawk, new to my Volusia list, and year birds Black-crowned Night-Heron and Great Shearwater (seen offshore during strong east winds). I added a few birds in the last week by specifically seeking them in suitable habitat. In this way I picked up Common Ground-Dove, Loggerhead Shrike, and Ruby-throated Hummingbird. If I had taken the time I very likely could have gotten Eurasian Collared-Dove, Bachman’s Sparrow, and House Finch. My biggest misses were Glossy Ibis and Wild Turkey. I just didn’t get out enough. Without the push of the Challenge, though, I surely wouldn’t have seen this many birds during June. Maybe next year I will try for 80…?